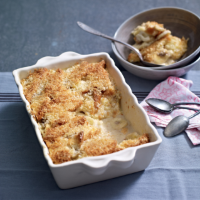 Bread and butter pudding is one of the nation’s most traditional desserts, and it’s a hearty, warming indulgence that’s just perfect at this time of year. 1. Preheat the oven to 180ªC, gas mark 4. Lightly butter the brioche and cut each slice into triangles. with the eggs until light and foamy. Stir in the coconut milk and whole milk until well blended. 3. Line the base of a large oven proof dish with a third of the slices of bread and top with some of the banana slices. Repeat until the bread and banana are all layered into the dish. Pour over the egg mixture and set aside to soak for 10 minutes. 4. Scatter the reserved sugar and the coconut on top. Sit the dish ina large roasting tin and pour boiling water into the tin so it comes two thirds up the side of the dish. Bake for 40–45 minutes until set and golden brown. The simple bread and milk base of this dish allows for many different flavour combinations. Try slices of mango sprinkled with cinnamon in place of the banana, or top with chopped apricots and pistachios.